Internet users are more prone to using ephemerality as a tool within social media to share their private memories. This is due to the fact that there is an underlying catharsis with being able to let-go of negative recollections and having the ability to control how the memory is handled under various settings. However, many available online applications (apps) do not truly conceal one’s memories, and thus, give web users a false sense of privacy. To respond to this challenge, an ephemeral journal, in the form of a mobile/tablet app, will be designed. This ephemeral journal is based off of researched therapeutic techniques, such as Free Form Writing and Release Writing. Pulling methods from such techniques’, those who struggle with their mental health are able to vent their negative thoughts using a digital pen or keyboard in the app. After, app users have the option of setting an ephemeral control over it, which includes letting the thought expire after an elapsed time, or permanently disposing of it. This journal is created for the purpose of giving those who struggle with their mental health a guaranteed place of clarity and confidentiality for their thoughts. Over the course of 12 weeks, the app will be designed using digital prototyping tools, user-tested by voluntary participation, and refined based off of the session. Before using, the app’s objective is to communicate in a text description that it is an ephemeral journal, which, unlike most journals, does not archive entries or use the web to store information on the user. During the usage, the app prompts users, through a message, that they are able write down their thoughts, using a keyboard or digital pen, in the provided space on the mobile/tablet screen. The app will not communicate restrictions on how the user should use the app (for instance, ‘do not scribble’). When the writing stage is complete, the app must communicate, through options, the various possible ephemeral timer and methods of digital disposal. After using the app, its objective is to assure the user, through a message, that their information is truly scrapped or unable to be accessed during the timer stage. the user control. Additionally, another objective is to give users the option of digitally disposing the entry instantly. If the user decides to dispose of the entry, the experiential objective is to convince the user the entry is truly gone. This can be done through adding “trash noises”, such as crumpling or throwing an object away. Before operating, the app’s behavioural objective is to give prospective users the sense that this app will be useful in therapeutically venting in a space that they can have full control over. During the usage, the app’s behavioural objective is to get users to click through a walkthrough, and briefly read on how they can use the app, and define that there are no restrictions. Upon prompting the user to write, the user is able to scribble, draw, compose endless paragraphs, or type for the purpose of venting. After completing the writing stage, the app’s behavioural objective is to allow users to choose if they want the entry disposed immediately, or given various ephemeral timer options. This allows users to understand that they are truly in control of how they handle their entry and know the restrictions of either disposing (never being able to access it again), or setting an ephemeral timer (never being able to access it again and slowing watch it fleet away). Ajit is a 24 year old journalist at the New York Times (NYT) in New York City, New York, USA. In his spare time, Ajit relaxes in his state-of-the-art New York condo, likes to call and check up on his family abroad via social media, attend yoga sessions, and assess his persistent agoraphobia symptoms through some techniques he picked up in previous Cognitive Behavioural Therapy sessions. Recently, he was promoted as a head journalist in a brand-new office section in the NYT Midtown Manhattan building. However, Ajit noticed that as soon as he was relocated, his panic attacks have gotten worse on a daily basis. As he has been bombarded with more responsibilities at his new job, he has found it difficult to make time for himself to manage his phobia or visit a therapist. As a result, he avoids specific areas at work on a daily basis to evade panic attacks, and even started calling in sick. He is too afraid of telling his co-workers about the state of his mental health, and does not want his family overseas to worry. Ajit is trying to find a way to evaluate his anxious thoughts to finally get peace of mind, while still managing his new busy schedule. Kristen is an 18 year old grade 12 student attending Westmount Secondary School in Hamilton, Ontario, Canada. She lives with her parents and three sisters in a quiet middle- class apartment in Hamilton. She is an avid gamer, who enjoys interchangeably gaming on her PC laptop, Samsung Galaxy Tab, and iPhone apps. Recently, Kristen has been having trouble managing her social anxiety. After consulting her school’s social worker several times and trying out a few wellness apps on her iPhone, she is feeling overwhelmed at the lack of success she is having with managing her social anxiety. After speaking with her parents, siblings, and friends, Kristen finds that no one truly understands what she is going through. As a result, she secludes herself from family events and avoids hanging out with friends. She is concerned about how her mental health is affecting her personal relationships and how it will impact her in the future. Kristen is looking for a space to anonymously open up her fears and anxieties without being judged by her close relatives. Dougie is a 31 year old social media marketing consultant at MKT Communications in Calgary, Alberta, Canada. Dougie is constantly surrounded with technology around his office and home, and owns the latest MacBook, iPhone, and iPad. He lives with his girlfriend in a middle-class neighbourhood in Airdrie, Alberta. For the past several months, Dougie and his girlfriend have been having a tough time with their relationship, and are on the brink of splitting up. Dougie has urged his girlfriend to attend a couple’s therapy session with him after his work hours, but she is reluctant. He has difficulty voicing his concerns to her, as she avoids him when he is aggressive and angry. Dougie is searching for a method to securely vent his hostile thoughts, in a way where his girlfriend will never find out. This tablet/phone app will be available for download at the App Store (for iOS users) and Google Play (for Android users) in the future. Upon finding the app on the store, users will be able to view the app details section, such as browsing through photographs, reading the app description, and looking at reviews. When users decided that the app is beneficial to them, they will download it on their device. Upon clicking the ephemeral journaling app, the app will begin a walkthrough, where the user has the option of skipping the walkthrough, or tapping and reading along the introduction. It will welcome the user, tell them that this a space for venting negative thoughts. The app tells the user that there is no right way of venting; the user can scribble, jot down, write, draw, or do whatever they please in the space provided. The app will then prompt users to add a passcode for privacy reasons, which can be changed later in the settings tab. The app will mention that users have the option of typing on their internal tablet/phone keyboard, connecting their digital pen to write with their hand or even an external keyboard to type on. This process involves connecting Bluetooth (if the pen or keyboard is external). The app prompts users to turn off their wifi connection to assure them that the information they write is not transferred or archived outside of the app. After prompting users to connect their external device (if they choose to), the app will offer the user with a journaling space. At this stage, there will be no instructions. 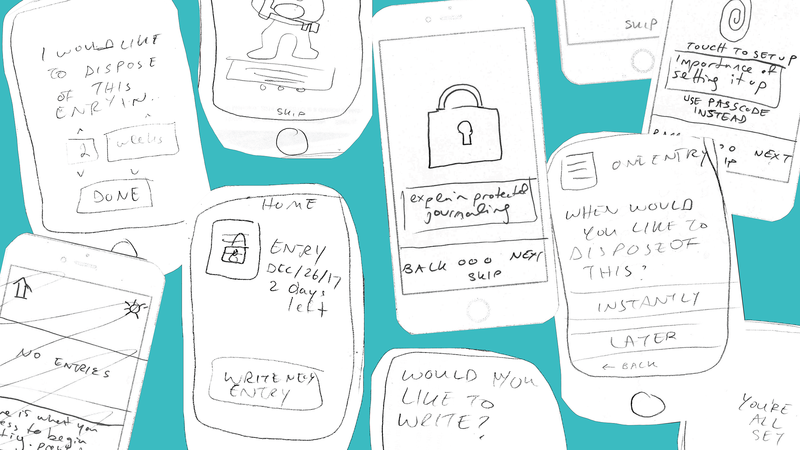 Users are free to write, draw, scribble, etc. with no time, location, or writing space limitations. Users are encouraged to spill out any negative thoughts they have. When finished, users press a ‘Done’ button. The app will then instruct users to control how they want to deal with their journal entry. This can be done in two ways: Disposing of it instantly and permanently, or setting an ephemeral timer on the entry. If the user chooses to instantly delete the entry, there is a ‘Delete’ button, which the user can click. The app will ask, ‘Are you sure you want to delete this entry? This cannot be undone’. Upon clicking ‘Yes’, the user will hear a ‘trashing/ crumpling noise’ and watch the entry delete in front of their eyes. However, if the user decides to set an ephemeral timer, they have the flexibility of stating how many hours, days, weeks, or months they want their information to fleet away for. Upon choosing a specific duration, the app asks, ‘Are you sure you want to set this timer? This cannot be undone, and you cannot access this entry during this duration’. When the user clicks ‘Yes’, the entry is locked, and visually begins to dissipate during that time period. After disposing the entry, the app tells you that you have successfully decided to let-go of your negative thoughts. It reminds you that your secret is safe with the app. The app then asks if you would like to write another journal. If ‘Yes’, a new journaling space is opened. If ‘No’, the app takes you back to the home page. When exiting the app, users should feel a sense of catharsis for relieving their undesirable thoughts. They would use the app as either a habitual therapeutic tool, or possibly for certain negative circumstances.